This will be the first Amazon apprenticeship program to be launched on the East Coast. Northern Virginia Community College (NOVA) and Amazon Web Services (AWS) announced a new innovative apprenticeship program designed to train veterans in Northern Virginia. The announcement marks the launch of the first-ever apprenticeship programs for AWS on the East Coast. The apprenticeship program is designed to fill a growing need for tech talent in the northern Virginia region. In October 2017, there were 23,000 job postings for employment opportunities in the tech sector in northern Virginia. The apprenticeship program will train individuals for Associate Cloud Consultant (ACC) positions. 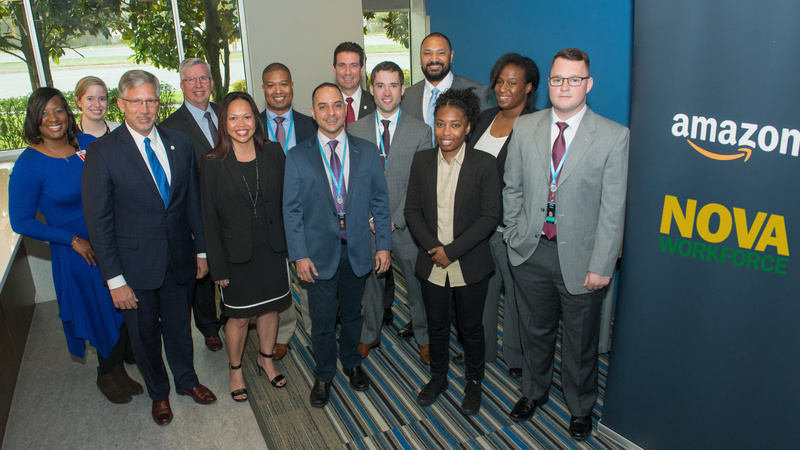 This all-veteran cohort entered training at NOVA for 16 weeks and will continue with on-the-job training at the AWS Herndon headquarters. Throughout the course of their program, apprentices will earn a series of highly-technical industry certifications that are in-demand by the technology sector, including: CompTIA Network+, Linux+, and the AWS Solutions Architect. The northern Virginia region has three times the average number of IT workers when compared to the rest of the United States. This apprenticeship program is an example of how business and education can creatively and successfully collaborate to address unique workforce challenges. NOVA’s large student veteran population and diverse offering of technology training programs help businesses find the highly-skilled tech talent they need to succeed, ensuring that the region to remain economically competitive. For additional information about apprenticeship programs at Northern Virginia Community College, please contact Steven Partridge, Vice President of Workforce Development at spartridge@nvcc.edu.